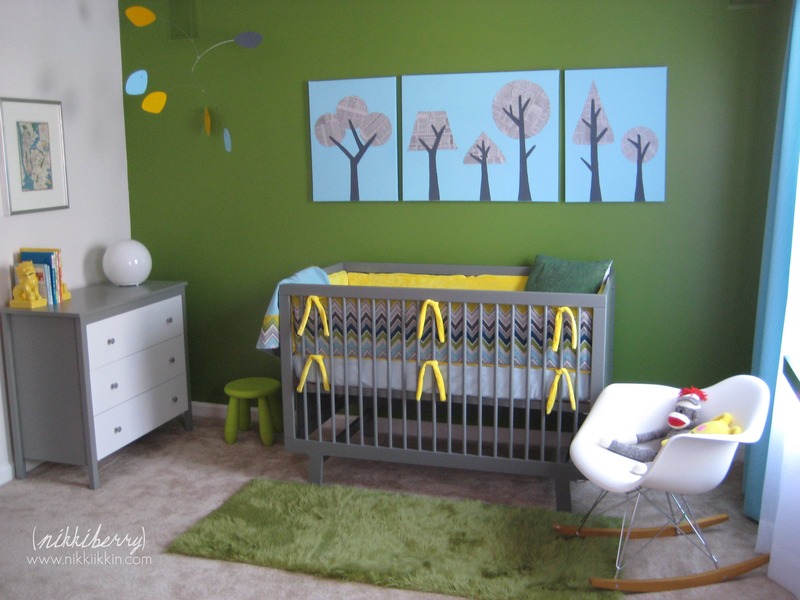 Being an interior designer I had high expectations for myself to create a nursery for my son that was beautiful; being a craftswoman I had high expectations for myself to create a nursery for my son that was custom-made. 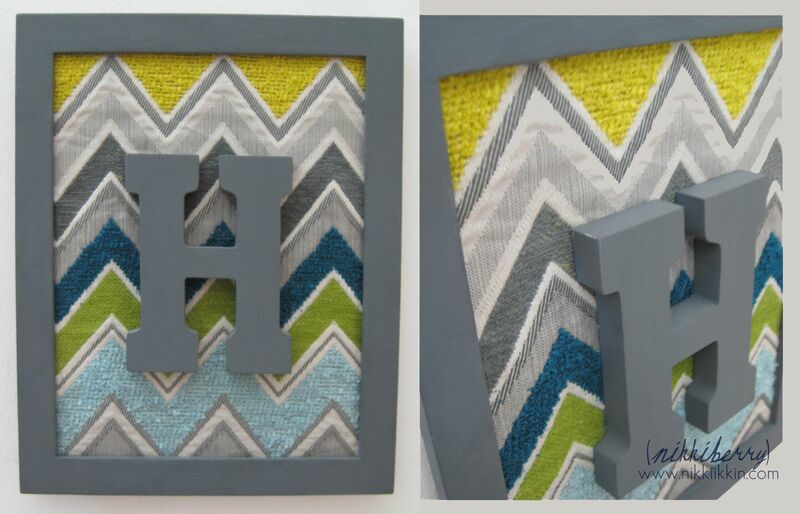 For Hudson’s nursery I delivered both. 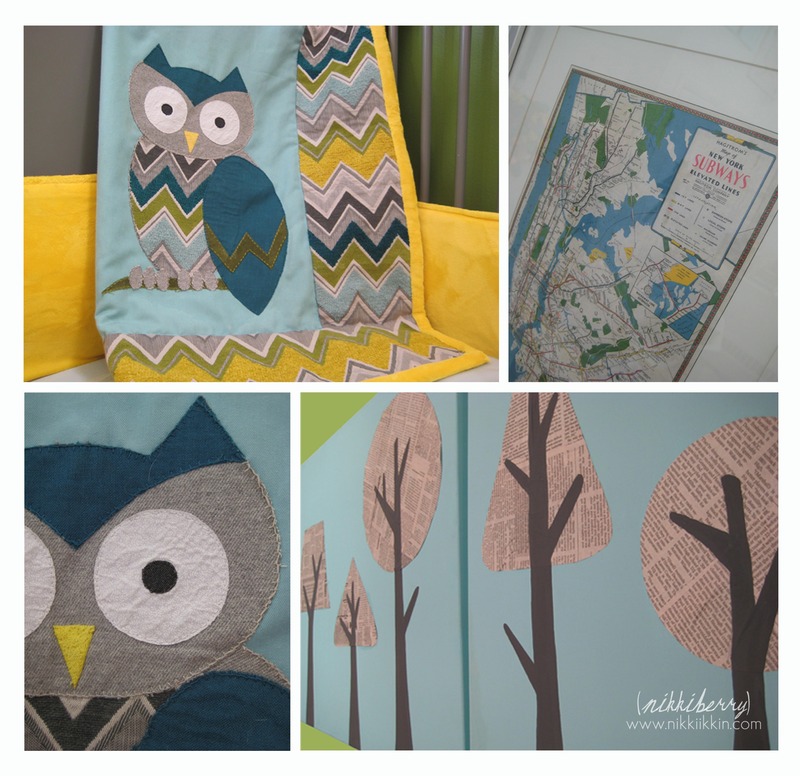 I named this nursery design and the owl on the quilt Oliver the Owl after Hudson’s middle name. 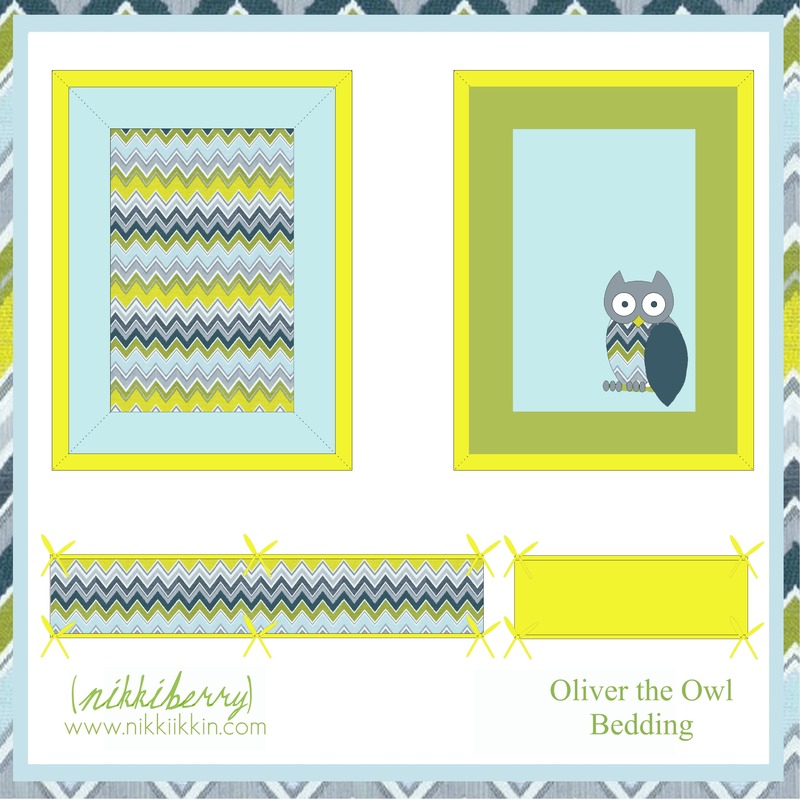 Although I was inspired by the Dwell Owl bedding that was brand new at the time, I decided to design and make all of his softgoods myself. 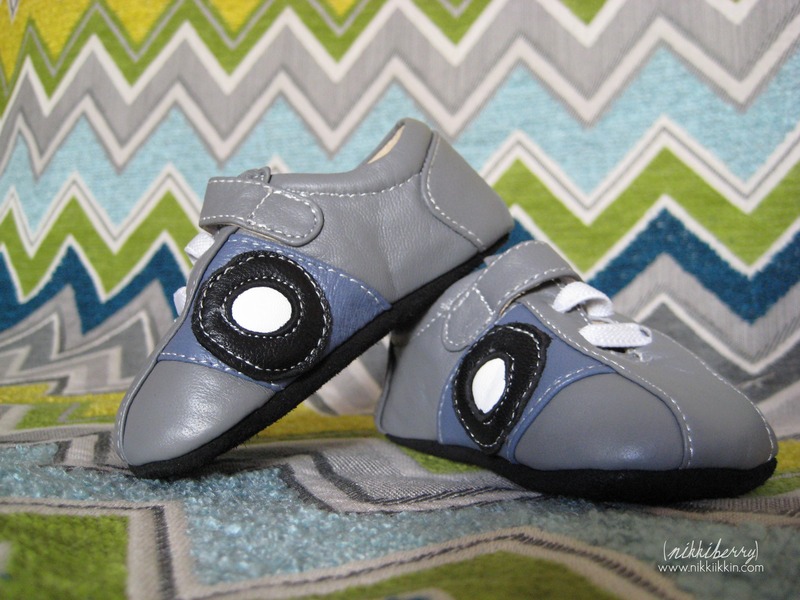 The bumper, quilt, sheets, canvases, drapery & rug were created by my hands. The framed art, mobile and dresser were also customized to better fit into my design. 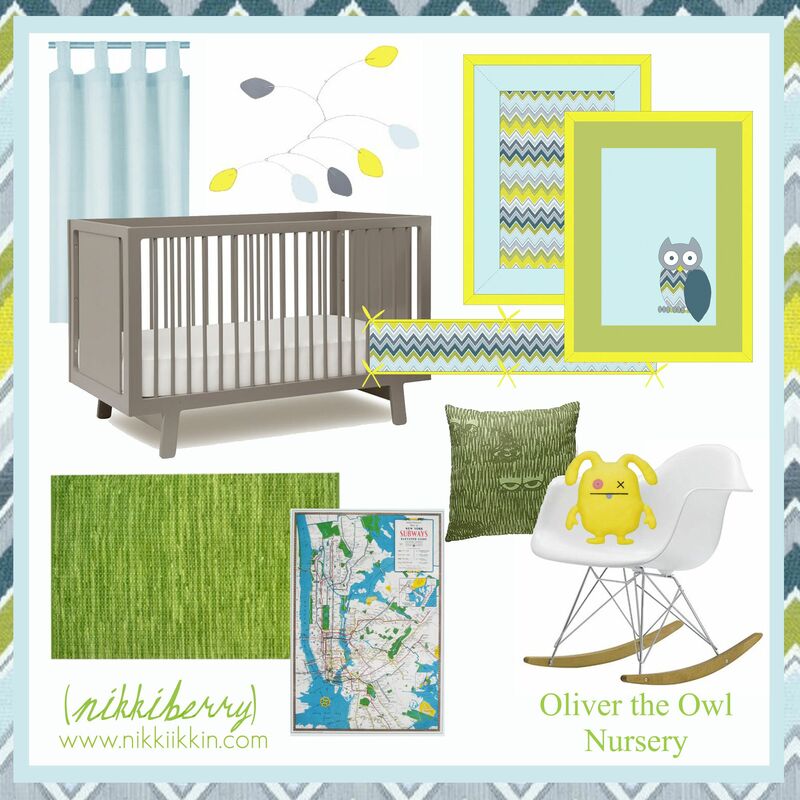 This nursery started with the gray Sparrow crib from Oeuf that I had choose whether I was having a Hudson or a Olivia. Second came the fabric, a F.Schumacher called Zeynatta Mondatta. Actually the fabric came years before, as it was a sample I held on to from my D&D Building fabric trips. I just had to have it but didn’t know what I would ever do with it, it was fate! I ran across it one day going through tear sheets and files and I instantly knew I’d found the inspiration for his room. In designing his bedding I had an allowance on how much of the zig zag fabric I was going to invest in, it was a very expensive fabric and luckily a fellow interior designer was able to get her hands on a yard sample for me (perks of the trade) and that helped out a bunch with the cost. In sourcing the other fabric locally in North Carolina I was tipped on a gem of a fabric store in the middle of nowhere. Mary Jo’s in Gastonia, NC, I couldn’t believe my eyes when I went there and it takes a lot to impress me. After the foundation theme and colors were decided, I started with product research and created an inspiration board and a board for his bedding design. I was proud to show them off at our baby shower, it was the only way for people to know what we were up to. To make the bumper I went to several baby boutiques to inspect the custom designs that were displayed. I took a hundred measurements of my crib and every bumper I ran across and I spoke with other designers about how they specify construction to workrooms. The quilt is composed of minky on one side and heavier weight fabrics on the other, its meant to be more of a top piece, decorative quilt. The owl applique is hand embroidered. The crib sheet (and later a pillowcase) was made from a twin sheet in just the right aqua color from Bed Bath and Beyond. The tab top drapery was modeled after another window panel my daughter has (super easy project). The rug is faux fur that I stitched heavy weight canvas to the back so that it would lay flat! We paid homage to Hudson’s namesake with artwork of a subway map of NYC, it was from a calendar that we already had and it was just the right colors. The RAR rocker was on my list of must have chairs (being obsessed with designer chairs), but I was on the fence whether to go with a color or white. White won for future versatility as it often does, but I also really love white furniture. His mobile was from CB2 but I had to paint a few of the pieces blue. 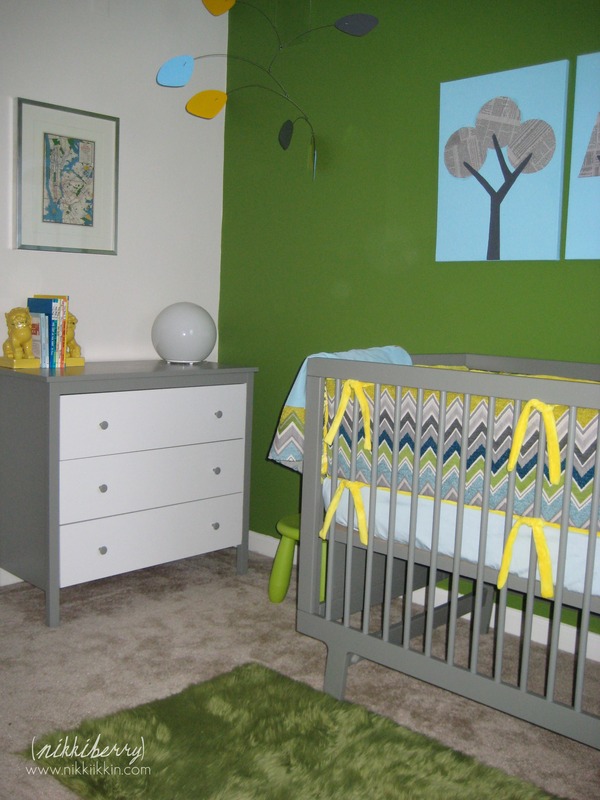 The Koppang dresser is an Ikea Hack, customed painted in a Ben Moore oil paint that was an exact match to the Ouef crib. 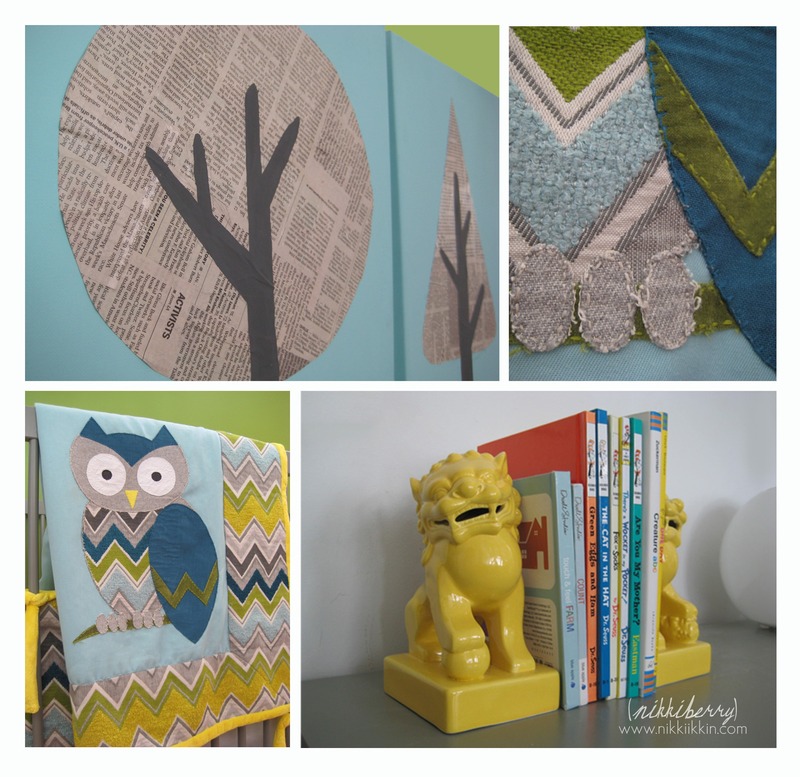 Its fun to stumble upon something that you know is just perfect: the Foo Dog bookends are from target, the FADO ball lamp from Ikea, the Where the Wild Things Are pillow is from Urban Outfitters and my husband insisted on having an Ugly doll. Lastly to be decided were in his room were the canvases. As you can imagine I had a lot on my plate making the bedding and in the back of my mind I had an idea for newspaper trees but I just couldn’t get to it before he was born. 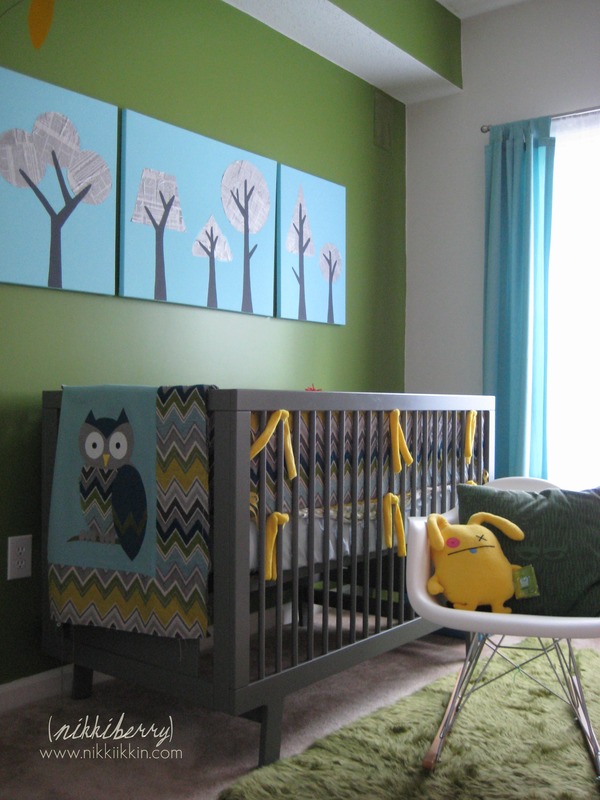 The canvases and (as well as few other items) were completed a few weeks after we brought Hudson home but he’ll never know we didn’t have everything ready for him!